Love these curtains but they snag easily so beware. They keep the light out and the warmth in. Give your den or bedroom a fresh, modern look with this lovely pairof curtains. 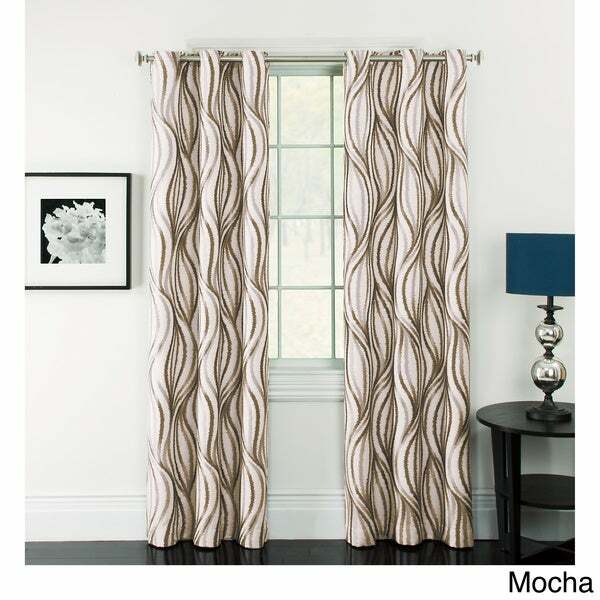 Featuring an intriguing design and neutral colors,these panels bring an uplifting sense of movement to your home.Elegant and contemporary, these unique curtains create a dramaticfocal point and give any room the illusion of a taller, moreexpansive space. Privacy is easy with these curtains due to their handyblackout polyester linings. This blackout design helps conserveenergy while blocking bright morning light, so you can sleep inlater. The curtains are made from durable, machine-washable fabricfor long-lasting use and easy care. These curtains were exactly what I was looking for. They are blackout curtains but don't look or feel like the typical industrial type you think of. The material is great and they are very nice quality for the price. I hate buying curtains..truly hate the process. I love the look of them, but they are expensive and its just such a process to get all the parts and everything measured just right to get curtains up and effective with the look and functionality. That being said, I saw these curtains online and I am happy to say that I love them. 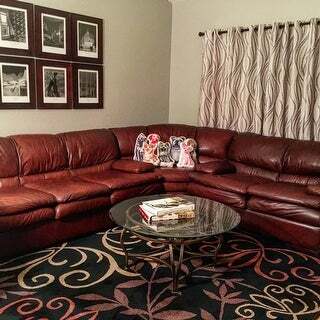 I got the cocco ones which go really well with my leather couches and neutral color scheme in my living room. I used these for a large bay window and got a double rod to have sheer white curtains to let the light in when I want. The look is fabulous, the pattern of these provides so much depth and texture to the room. Also - these curtains truly are light blocking. They darken the room and allow for privacy. They are also really thick and high quality. I am very pleased with them. I wish I got two more panels when they are were on sale, but I broke down and ordered more for the other windows in the room. Very pleased. I purchased three sets of these panels in the 63" length for a bedroom with three windows and lots of early morning light that i wanted to block out. Since I already had wood blinds on these windows, it was more a matter of adding some additional coverage around the edges. So they work fine for my needs. I used hardware that allows you to wrap the curtains around the sides of the windows and the panels fit snugly against the walls. However,These are not true blackout curtains since they are translucent and do let in some light. If you need true blackout curtains, then choose another style. With all that said, the quality of the fabric is quite nice, with an embroidered wavy pattern in blue, grey and tan on a creme background. No need to iron as wrinkles quickly come out once hung. One caveat here. I had to return a set since one panel was a good three inches shorter than all the others which I found to be disconcerting and strange. It's a matter of quality control. I'm hoping the new set comes in with no issues. I received the order quickly, free shipping a bonus! First off, the packaging was easy to unzip and remove the curtains, no difficulty there which I appreciate. The curtains are a bright modern update to my bedroom and do block out the light quite well while brightening it due to the color scheme. Easy to hang, easy to close and open. Plus the length is just perfect and no longer hang on the floor and block the air vent like the 84" ones did, 63" is perfect! Only thing I notice is there is a fray in the polyester material when I opened them. I think I can fix it or cut it off without jeopardizing the rest of the curtain but very irritating to get something new and have that straight out of the package. These curtains are great! I love that they are washable, thick and hang really nicely! After a few days the wrinkles are out and did not require ironing. very happy with these panel drapes for a large living room bay window. might be more taupe shades that silver/gray, but worked in my décor. keeps west, late day sun out, easy to pull open and closed. They look gorgeous on the website picture, but when they arrived they looked like cheap hotel curtains. They are thick enough to block out light, but definitely not the look I was going for. The color was off - I ordered the blue ones. Think about a cheap hotel you've been in and the plastic rod to open and close the curtains? That's where these belong. Easy to hang with wide grommets. They do block out light completely. I love these curtains because they seem sturdy and will last a long time. I have received several compliments about how the curtains have made my living room so much better. I used this opportunity to tell them where I bought the curtains from. These curtains deliver. They are everything I was hoping for. They are great blackout curtains without looking and feeling heavy. The color is as promised and was exactly what I needed to complete my living room. I bought these for my family room and living room. I love the soft pattern, and they slide smoothly to open and close. These curtains are beautiful, and are more than i expected! I am so happy with them! And little if no wrinkles when i took them out of the package! I bought these to use as center panels with solid bronze drapes on each end. They give that pop and the solid drapes offset so the window coverings are not too busy. I fluffed these drapes in the dryer for a few minutes....to remove the wrinkles before hanging them. They went up as easy as can be. They look fabulous in my living room and look exactly as pictured on the website. These drapes look much more expensive than what they cost. They are bold...but not too bold - they make a statement. Love these curtains, Price is perfect. Color is actually as described. Matched my bedspread. These drapes are so nice. I’ve had them for at least 4 years and they still look great. Panels were purchased for my brother's handicap suite. Adds a definite pop to the room. Panels are very well made, block light as stated, and still holding up. Well worth purchase price. Was good material and nice but color did not match my room as I thought so I returned but would recommend to everyone if the design and color works for your room. This panel pair was a bit darker brown than I expected. Although, the style is very modern and a bit masculine, plus they have a white backing which is great for the outside look of the house! "Will you be stocking the blue option anytime soon?" Unfortunately, the blue option has been discontinued. "Hi. Do these come in 95"L? The 84"L doesn't work for my window." Unfortunately no, these are not available in 95 inches L.
"Can you tell me if these have a silk like sheen ... am trying to get an idea as to the fabric surface...??" There is no sheen to these panels. "In the Mocha panels what are the colors I'm seeing? Looks like mocha, white, tan and grey...Or is it Mocha, CREAM, and tan? Is there GREY in this????" The panels are more of a brown,tan, (some would say beige) and mocha. No grey. "Is this pattern available in a curtain that is not blackout? I would like some light to filter through." This particular style/pattern is only available as pictured. "What colors are in the mocha panel besides brown and cream?" The other color is a lighter tan. "Is the 54 inch width for each panel or for the pair?" Hello ninai, each panel is approximately 54" inches wide. Please let us know if you have additional questions. Thanks for shopping with us.